2 Objectives Define the key words. 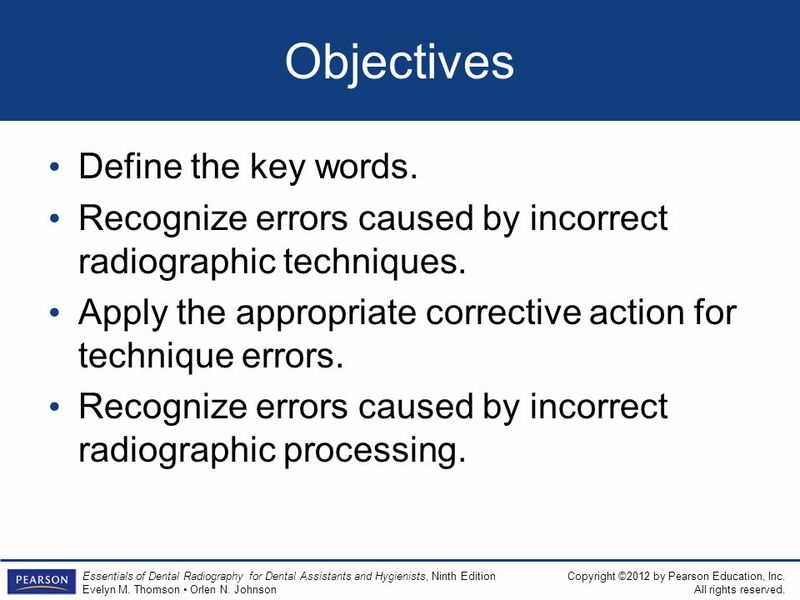 Recognize errors caused by incorrect radiographic techniques. Apply the appropriate corrective action for technique errors. 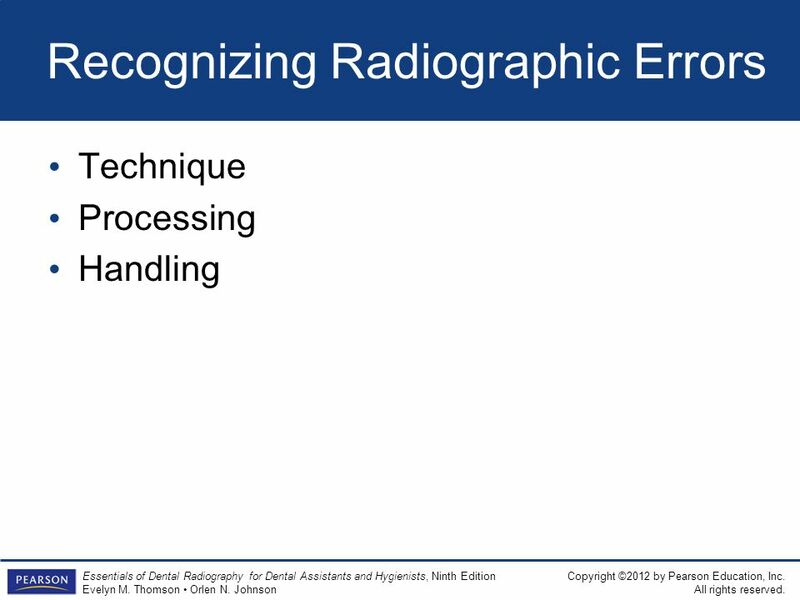 Recognize errors caused by incorrect radiographic processing. 3 Objectives Apply the appropriate corrective action for processing errors. 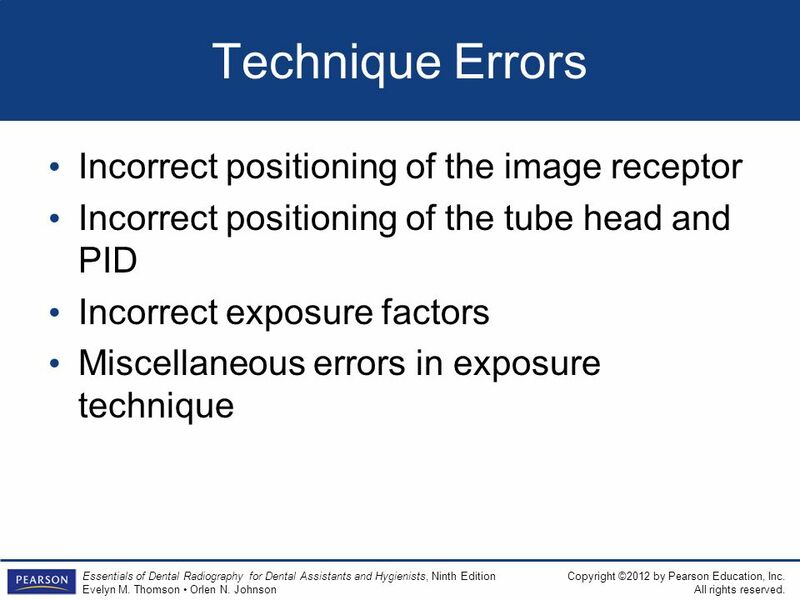 Recognize errors caused by incorrect radiographic image receptor handling. Apply the appropriate corrective actions for handling errors. 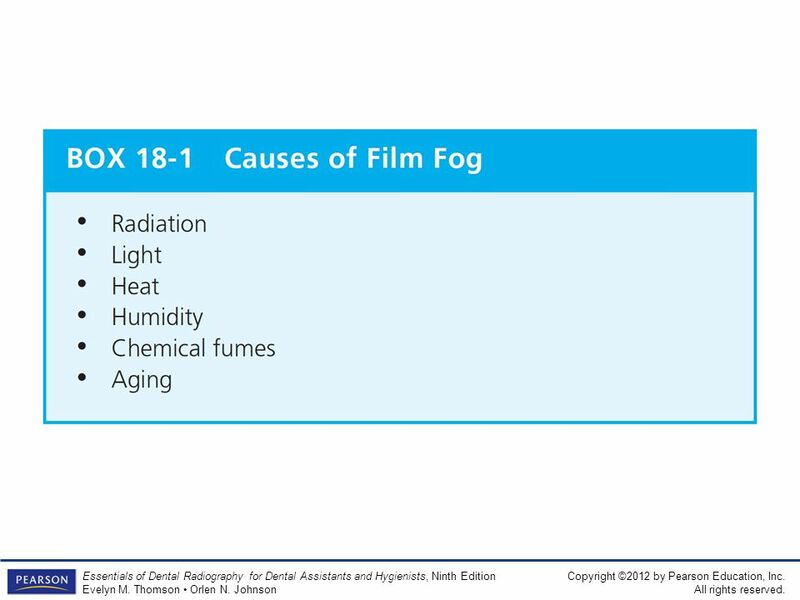 Identify five causes of film fog. 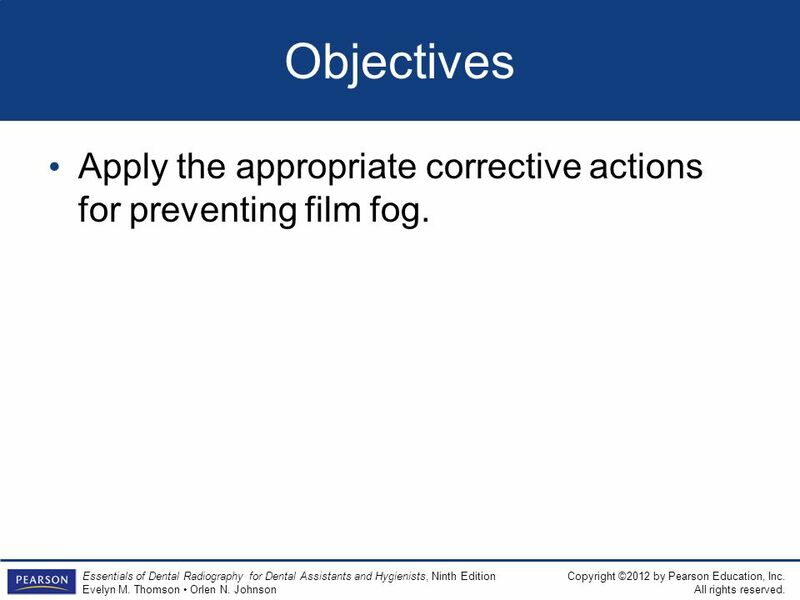 4 Objectives Apply the appropriate corrective actions for preventing film fog. 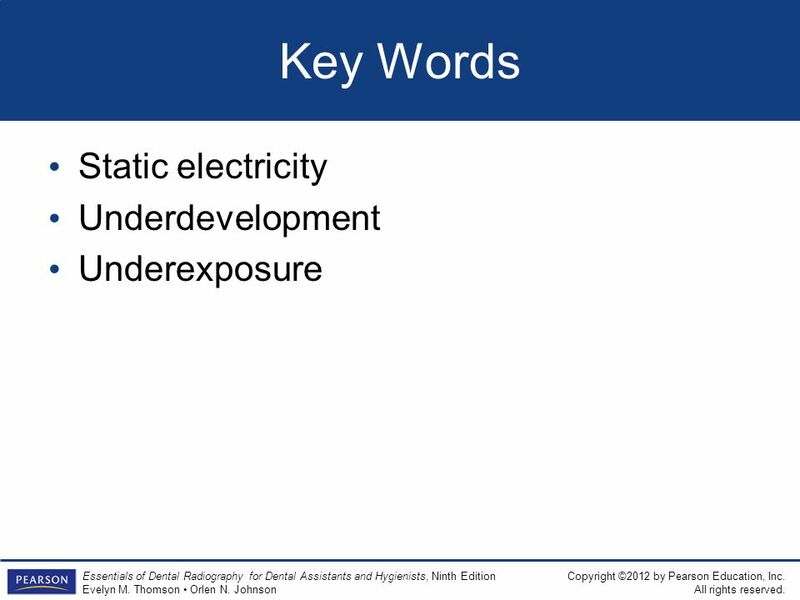 8 Introduction Although radiographs play an important role in oral health care, it should be remembered that exposure to radiation carries a risk. 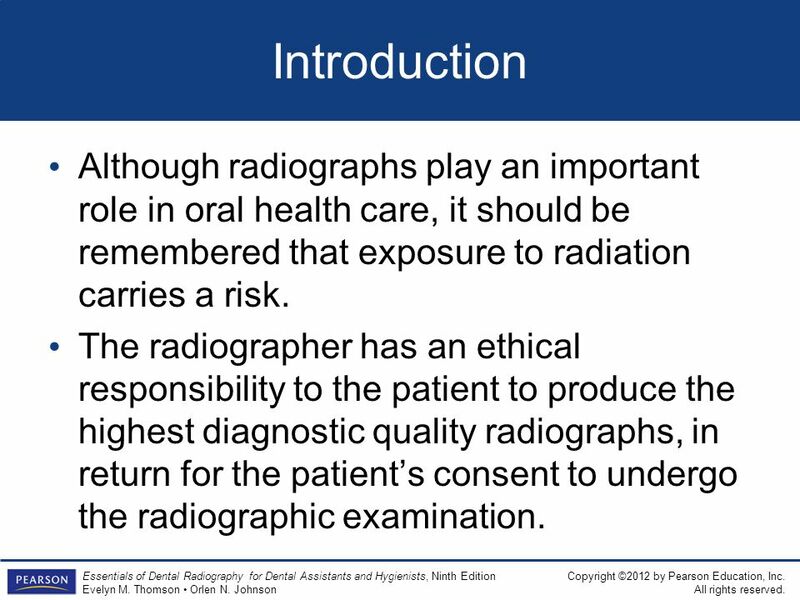 The radiographer has an ethical responsibility to the patient to produce the highest diagnostic quality radiographs, in return for the patient’s consent to undergo the radiographic examination. 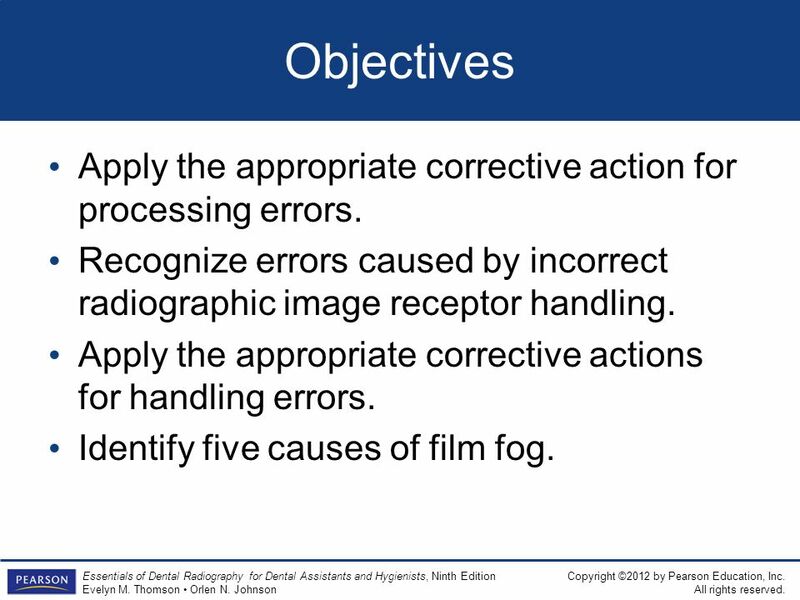 9 Introduction No radiograph should be retaken until a thorough investigation reveals the exact cause of the error and the appropriate corrective action is identified. 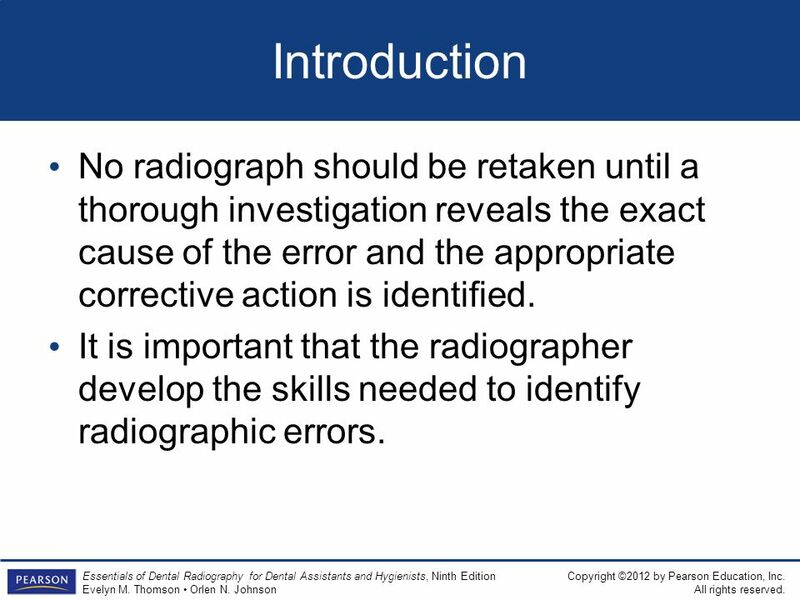 It is important that the radiographer develop the skills needed to identify radiographic errors. 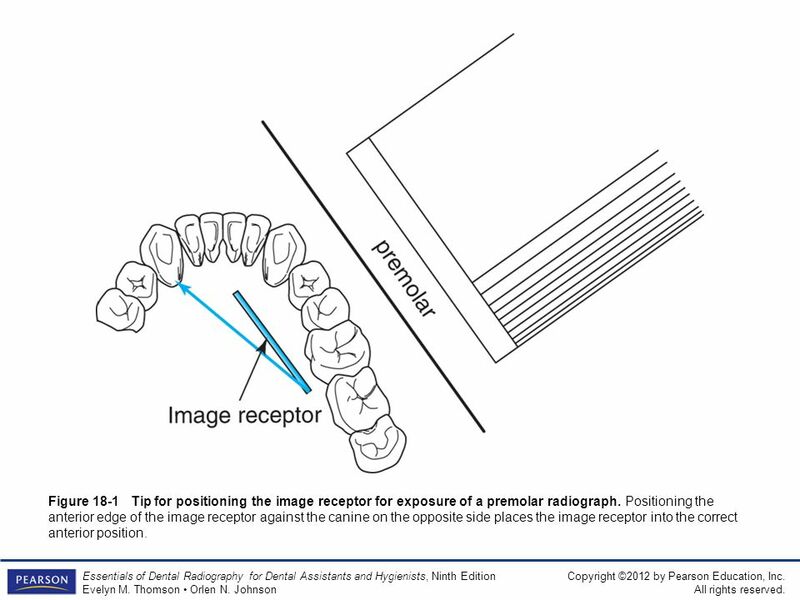 13 Figure Tip for positioning the image receptor for exposure of a premolar radiograph. Positioning the anterior edge of the image receptor against the canine on the opposite side places the image receptor into the correct anterior position. 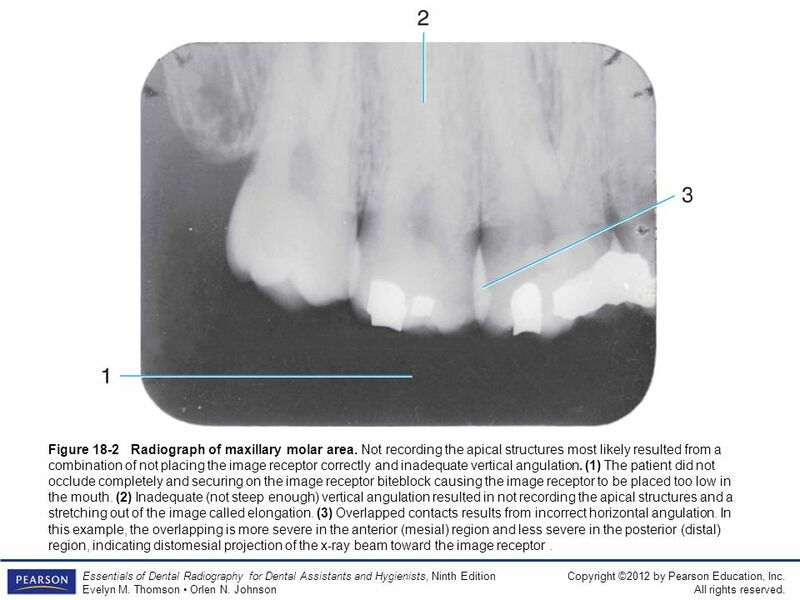 Figure Radiograph of maxillary molar area. Not recording the apical structures most likely resulted from a combination of not placing the image receptor correctly and inadequate vertical angulation. (1) The patient did not occlude completely and securing on the image receptor biteblock causing the image receptor to be placed too low in the mouth. (2) Inadequate (not steep enough) vertical angulation resulted in not recording the apical structures and a stretching out of the image called elongation. (3) Overlapped contacts results from incorrect horizontal angulation. In this example, the overlapping is more severe in the anterior (mesial) region and less severe in the posterior (distal) region, indicating distomesial projection of the x-ray beam toward the image receptor . 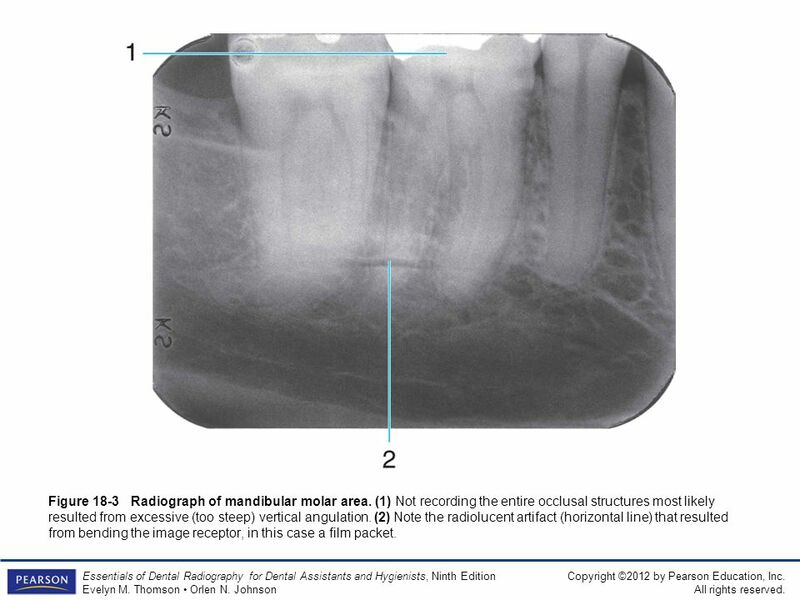 Figure Radiograph of mandibular molar area. (1) Not recording the entire occlusal structures most likely resulted from excessive (too steep) vertical angulation. (2) Note the radiolucent artifact (horizontal line) that resulted from bending the image receptor, in this case a film packet. Figure Radiograph of maxillary canine area. (1) Slanting or diagonal occlusal plane caused by incorrect position of the image receptor. (2) Foreshortened images caused by a combination of excessive vertical angulation and incorrect image receptor position. (3) Distortion caused by bending the image receptor. (4) Maxillary sinus, (5) recent extraction site, (6) lamina dura, and (7) image of the canine is distorted. Figure Reversed film packet error. These embossed patterns will be recorded on the image when the lead foil faces the x-ray beam. Note the different patterns depending on the manufacturer and the film size. Figure Incorrect reversed film packet. 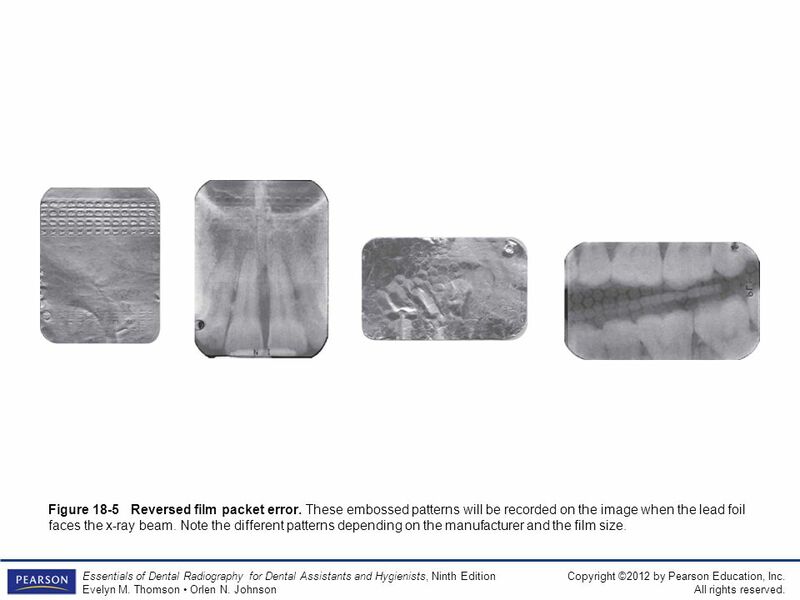 An examination through the ring of this image receptor holder assembly reveals that the back of the film packet will be positioned incorrectly toward the teeth and the x-ray source. 19 Figure Conecut error. Results when the central ray of the x-ray beam is not directed toward the middle of the image receptor. The white (clear) circular area was beyond the range of the x-ray beam, and therefore received no exposure. 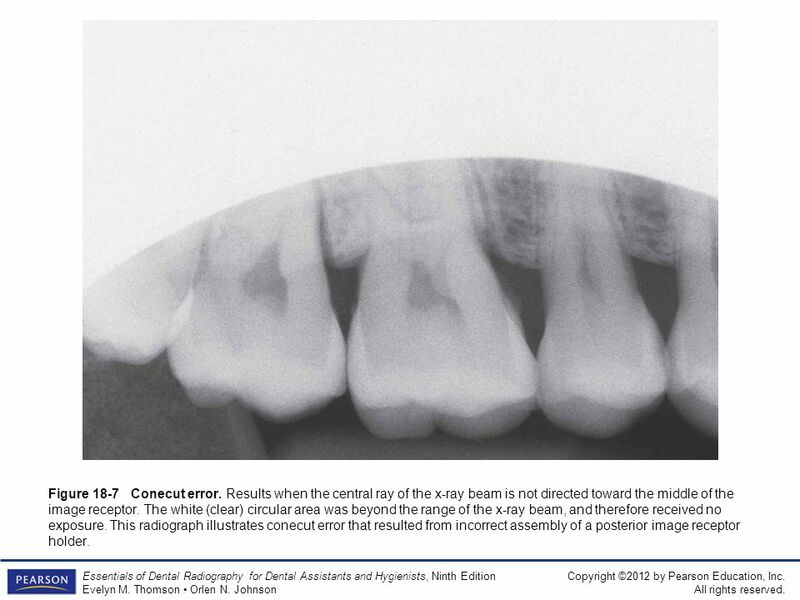 This radiograph illustrates conecut error that resulted from incorrect assembly of a posterior image receptor holder. 20 Figure 18-8 Conecut error. Can also occur when using rectangular collimation. Figure Light (thin) image. Underexposed or underdeveloped radiograph. 22 Figure 18-10 Dark image. 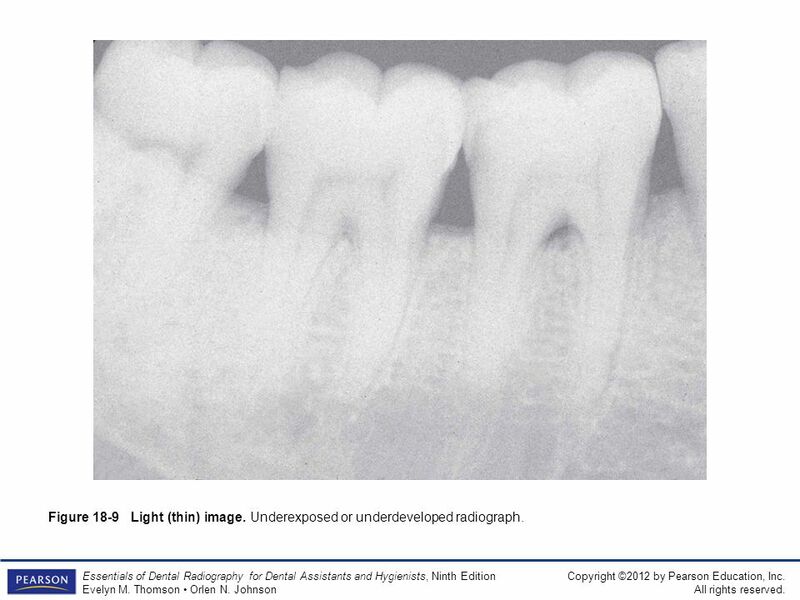 Overexposed or overdeveloped radiograph. Figure Radiopaque artifact. Partial denture left in place during exposure. Figure Radiopaque artifact. 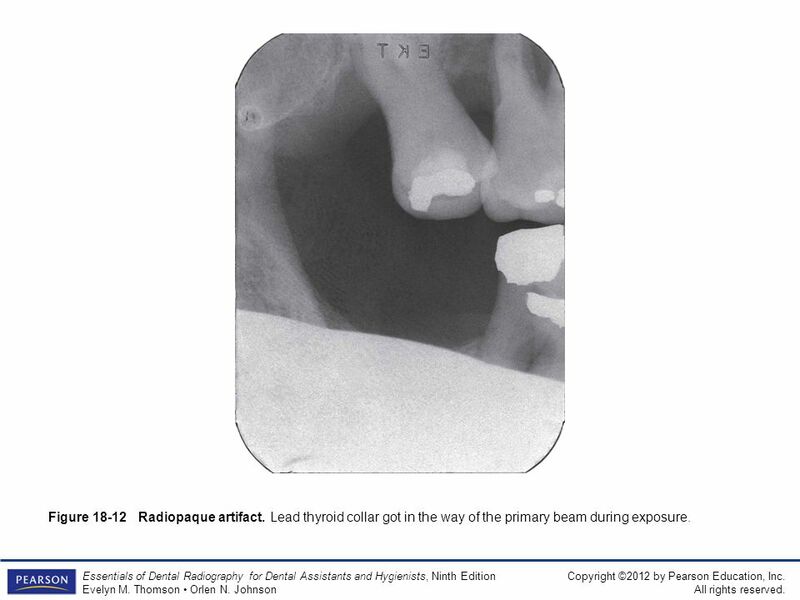 Lead thyroid collar got in the way of the primary beam during exposure. 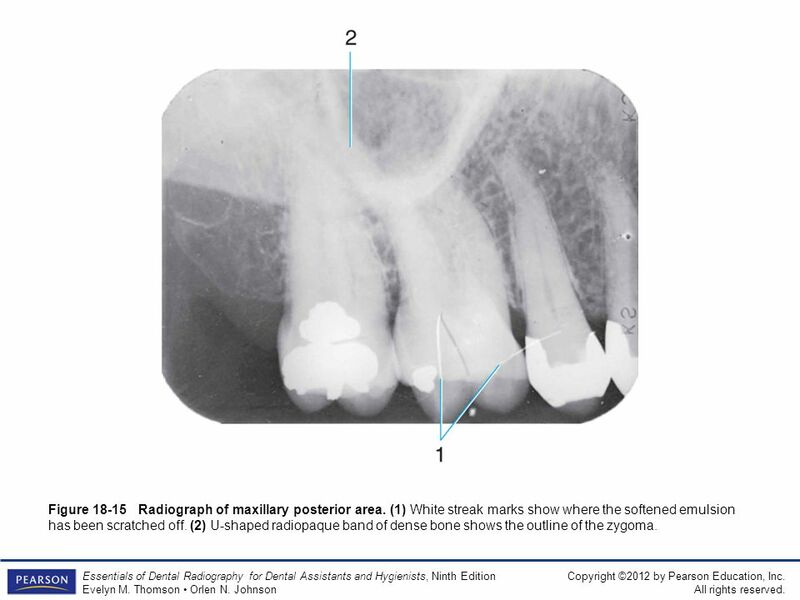 Figure Radiograph of maxillary molar area. (1) Dark spots caused by premature contact of film surface with developer. (2) Uneven occlusal margin resulted because the patient did not occlude all the way down on the image receptor biteblock. 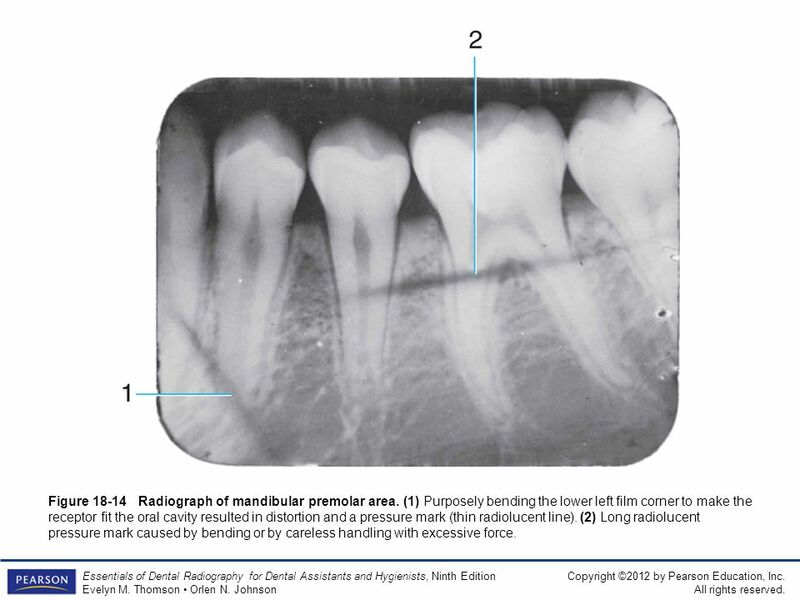 Figure Radiograph of mandibular premolar area. 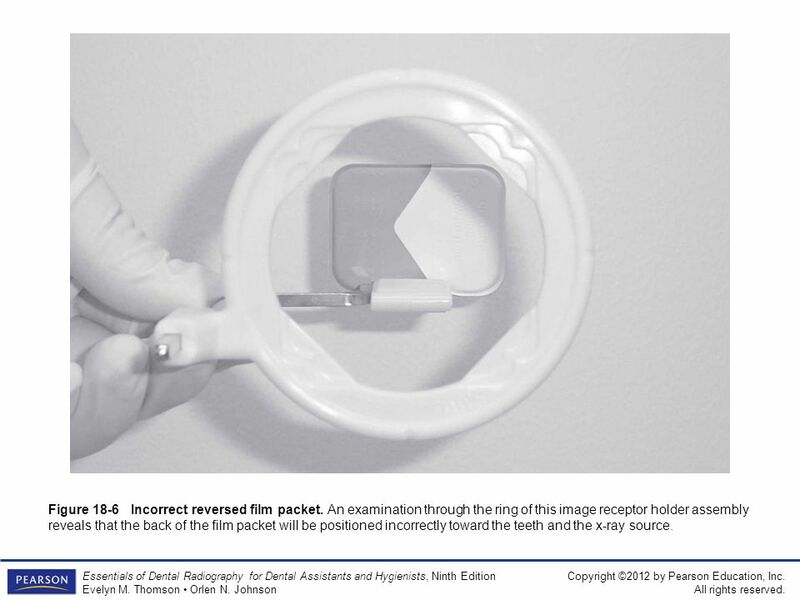 (1) Purposely bending the lower left film corner to make the receptor fit the oral cavity resulted in distortion and a pressure mark (thin radiolucent line). (2) Long radiolucent pressure mark caused by bending or by careless handling with excessive force. Figure Radiograph of maxillary posterior area. (1) White streak marks show where the softened emulsion has been scratched off. 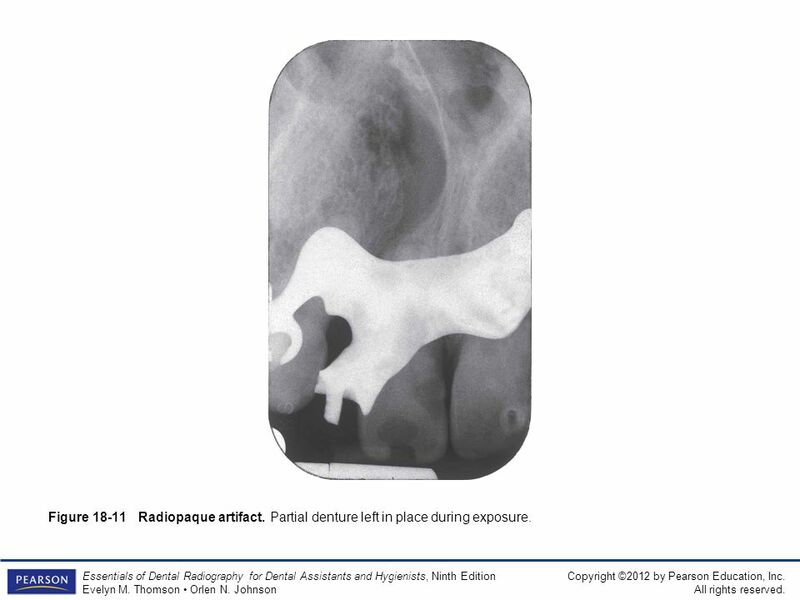 (2) U-shaped radiopaque band of dense bone shows the outline of the zygoma. 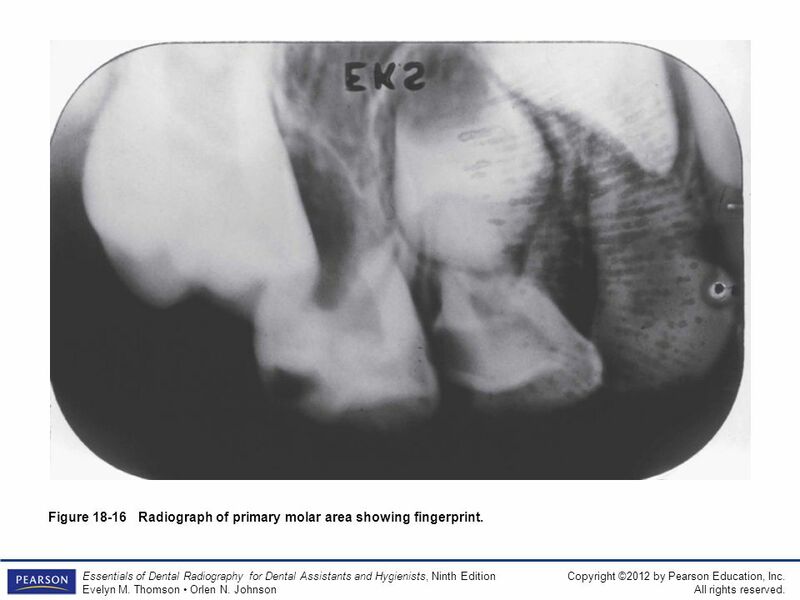 29 Figure 18-16 Radiograph of primary molar area showing fingerprint. 31 Figure 18-17 Film fog. Film fog results in lack of image contrast. 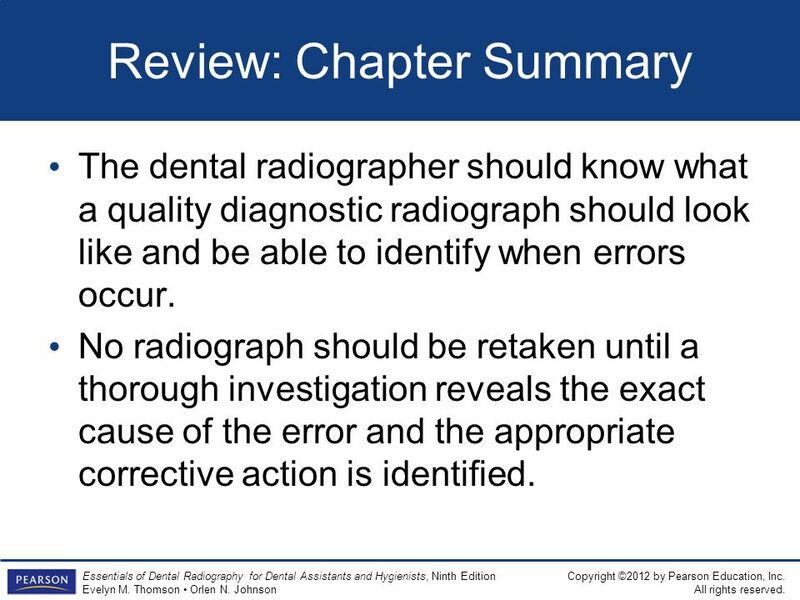 The dental radiographer should know what a quality diagnostic radiograph should look like and be able to identify when errors occur. No radiograph should be retaken until a thorough investigation reveals the exact cause of the error and the appropriate corrective action is identified. 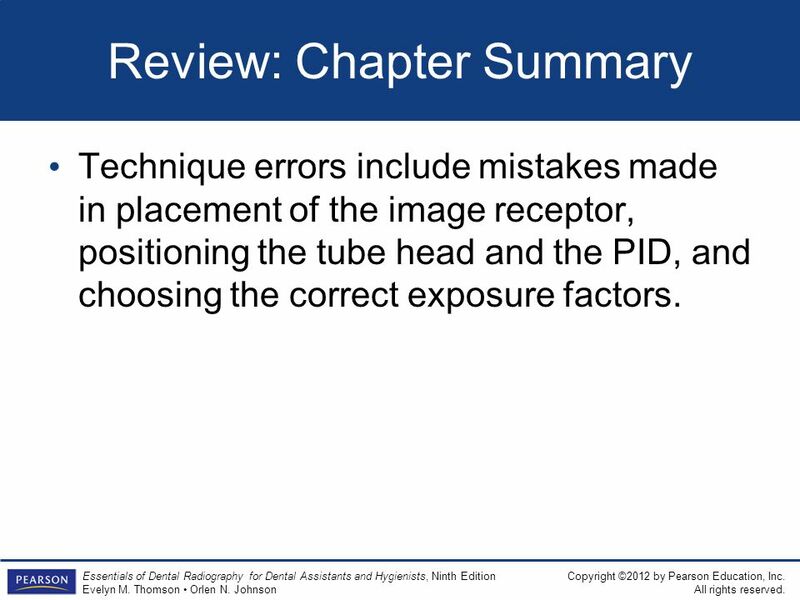 Technique errors include mistakes made in placement of the image receptor, positioning the tube head and the PID, and choosing the correct exposure factors. 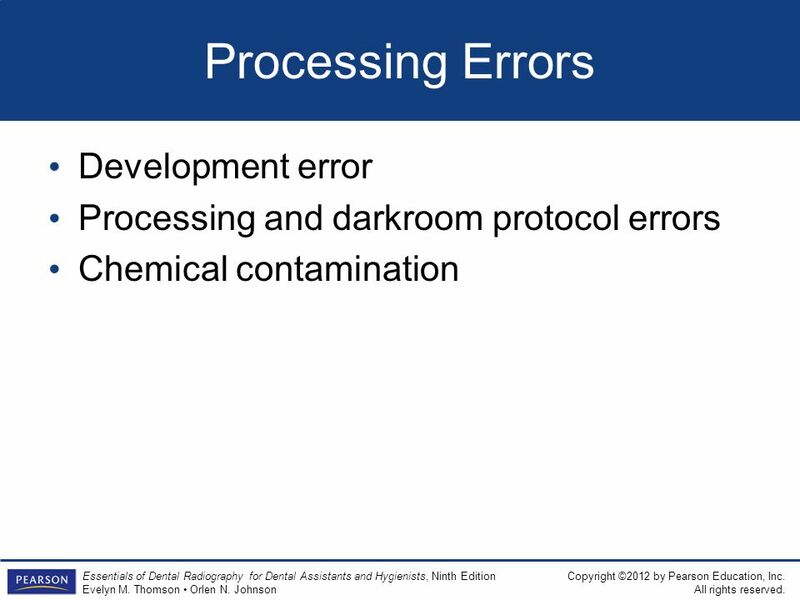 Processing errors include development mistakes, not following protocols for processing and darkroom use, and chemical contamination. 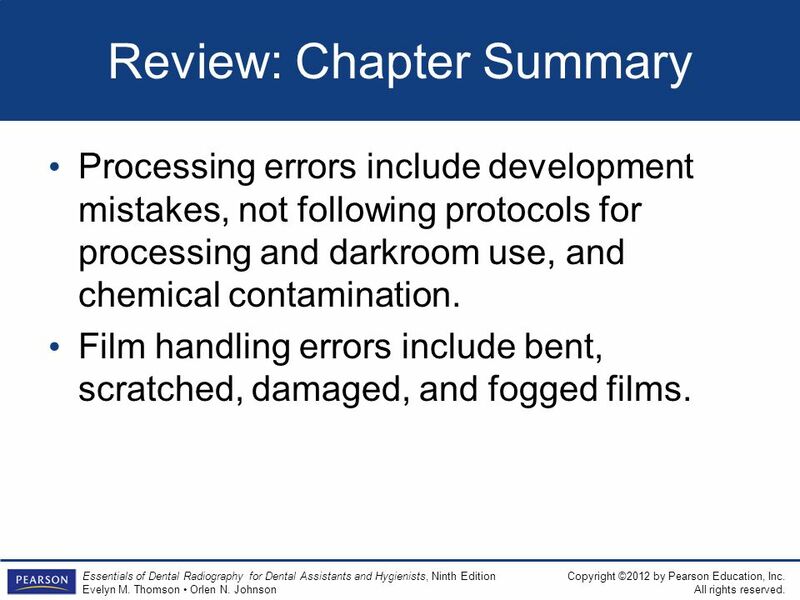 Film handling errors include bent, scratched, damaged, and fogged films. 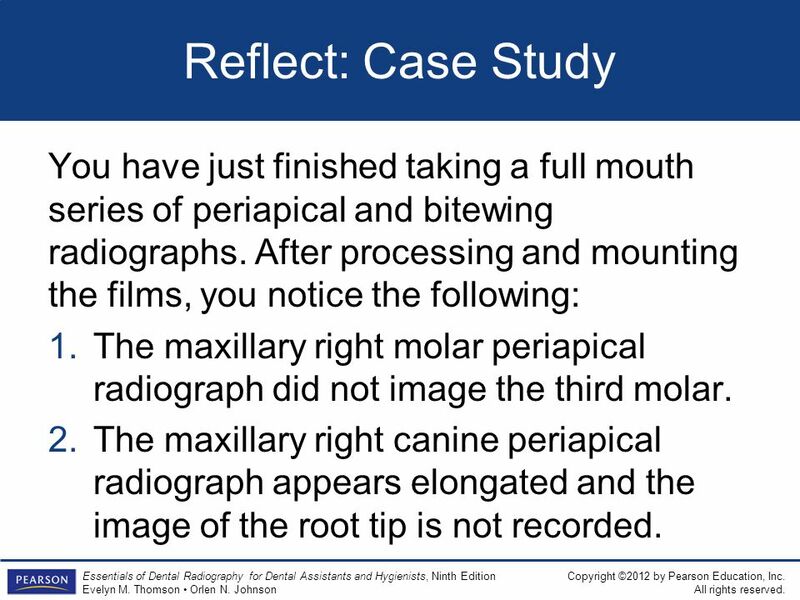 36 Reflect: Case Study You have just finished taking a full mouth series of periapical and bitewing radiographs. 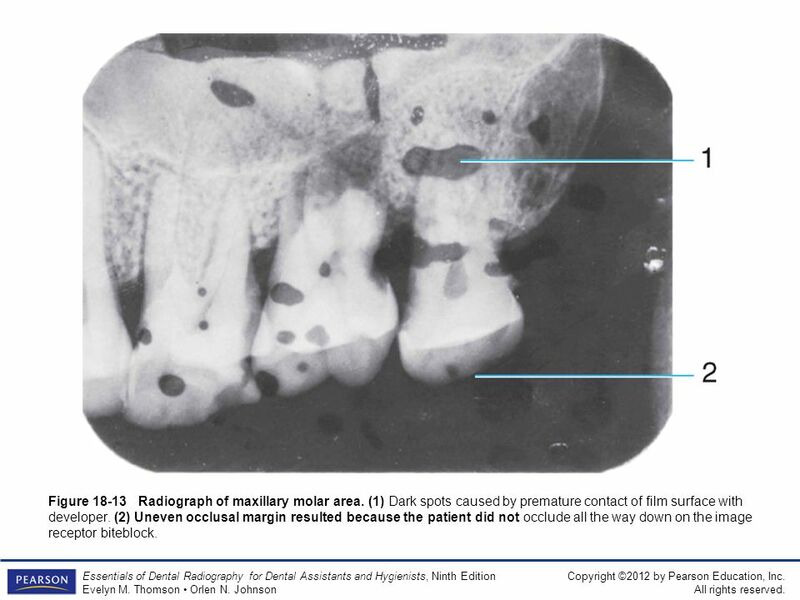 After processing and mounting the films, you notice the following: The maxillary right molar periapical radiograph did not image the third molar. 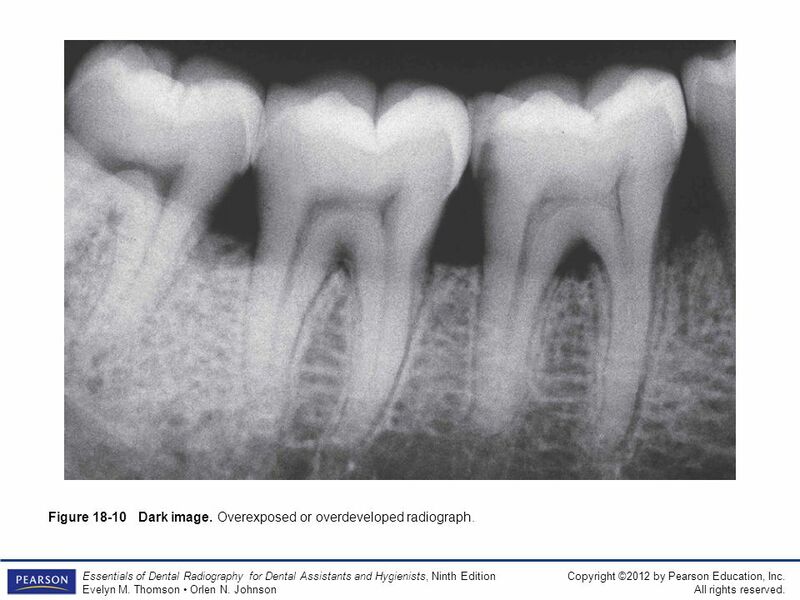 The maxillary right canine periapical radiograph appears elongated and the image of the root tip is not recorded. 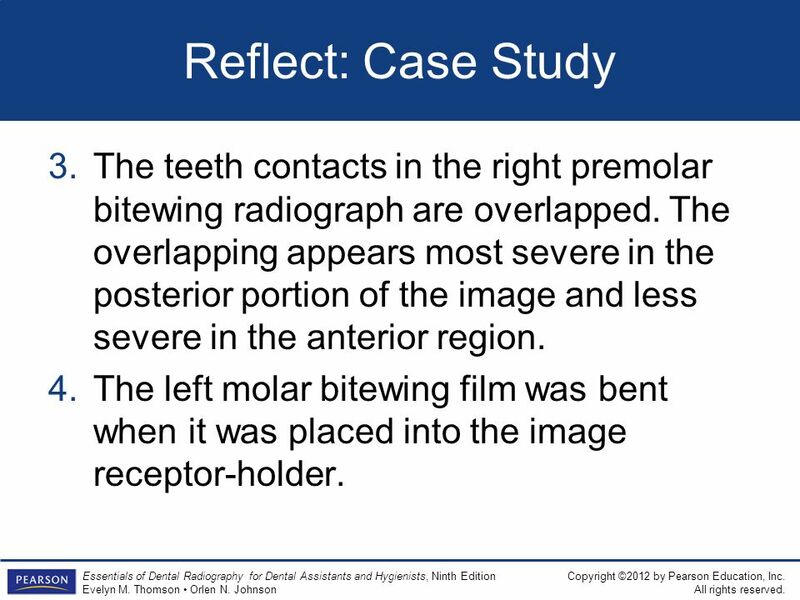 37 Reflect: Case Study The teeth contacts in the right premolar bitewing radiograph are overlapped. The overlapping appears most severe in the posterior portion of the image and less severe in the anterior region. The left molar bitewing film was bent when it was placed into the image receptor-holder. 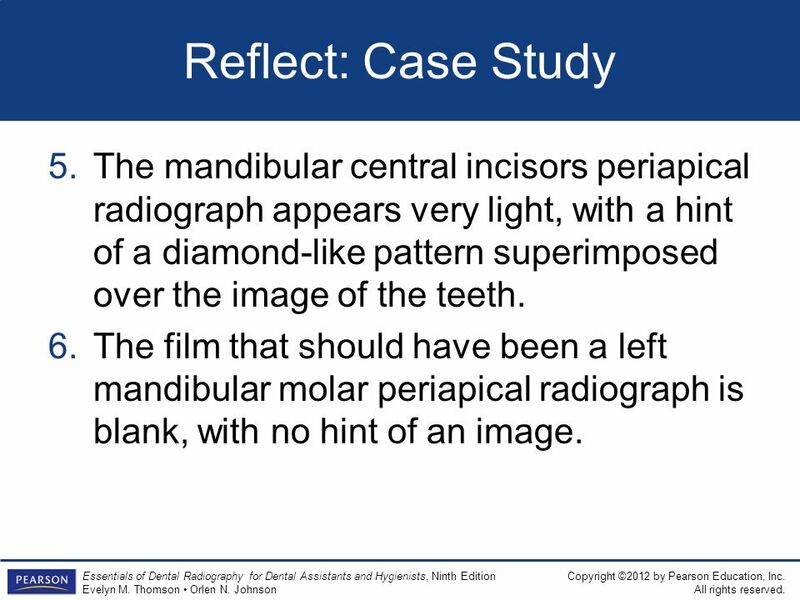 38 Reflect: Case Study The mandibular central incisors periapical radiograph appears very light, with a hint of a diamond-like pattern superimposed over the image of the teeth. The film that should have been a left mandibular molar periapical radiograph is blank, with no hint of an image. 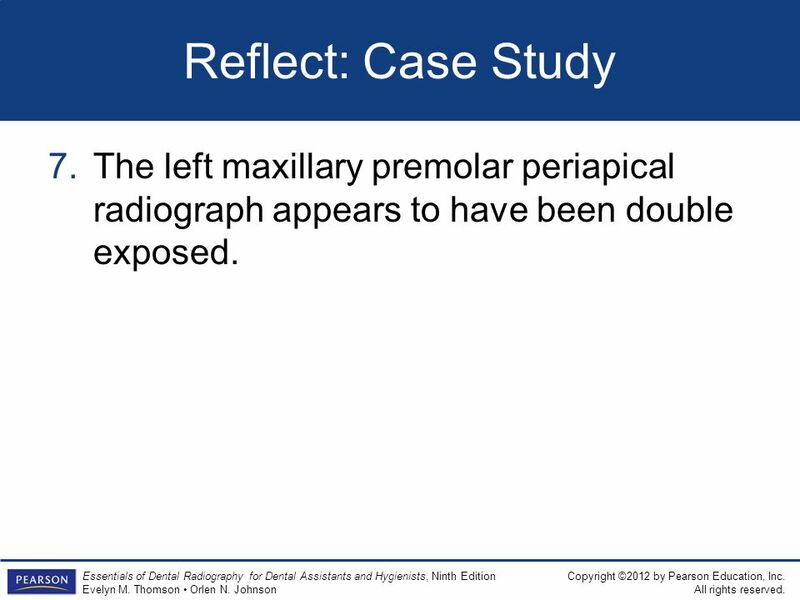 39 Reflect: Case Study The left maxillary premolar periapical radiograph appears to have been double exposed. 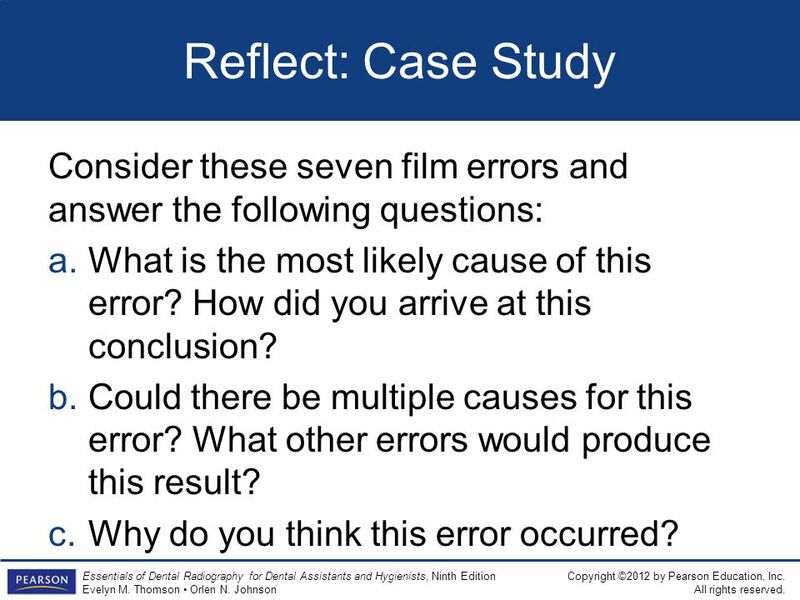 40 Reflect: Case Study Consider these seven film errors and answer the following questions: What is the most likely cause of this error? How did you arrive at this conclusion? Could there be multiple causes for this error? What other errors would produce this result? Why do you think this error occurred? 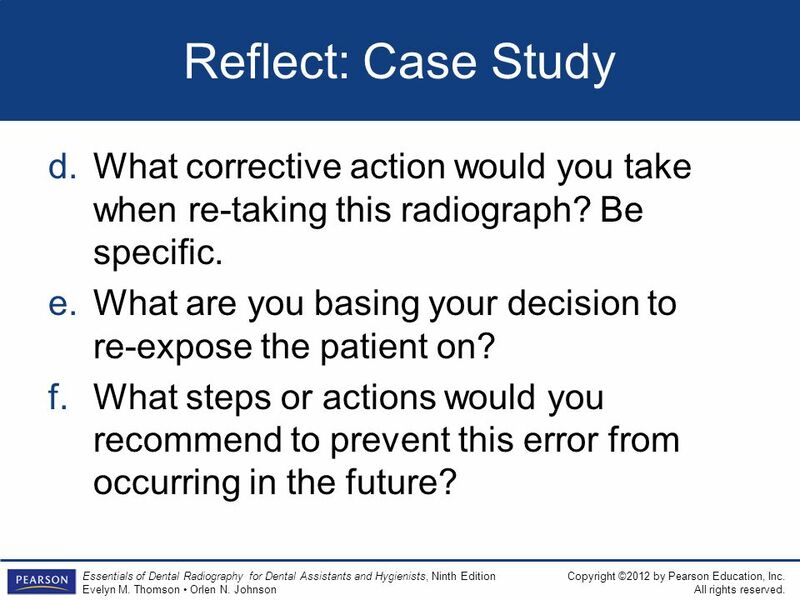 41 Reflect: Case Study What corrective action would you take when re-taking this radiograph? Be specific. What are you basing your decision to re-expose the patient on? What steps or actions would you recommend to prevent this error from occurring in the future? 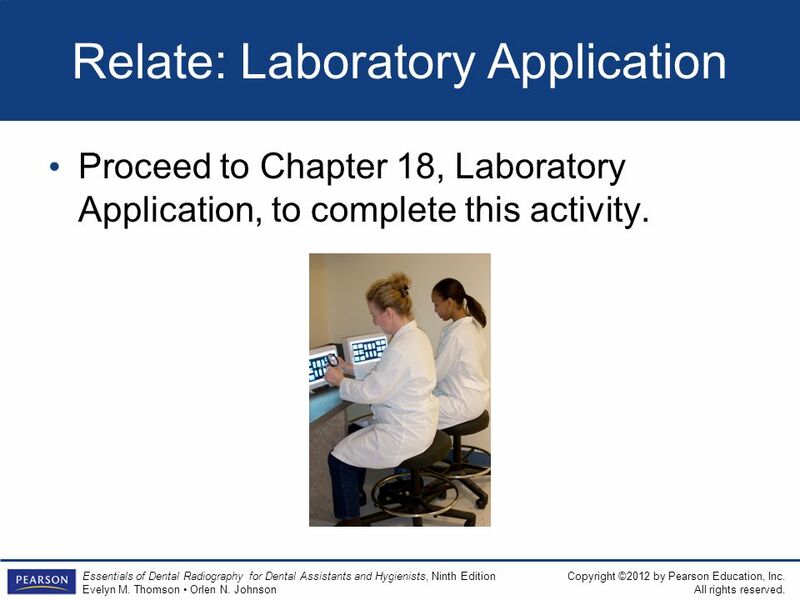 Proceed to Chapter 18, Laboratory Application, to complete this activity. 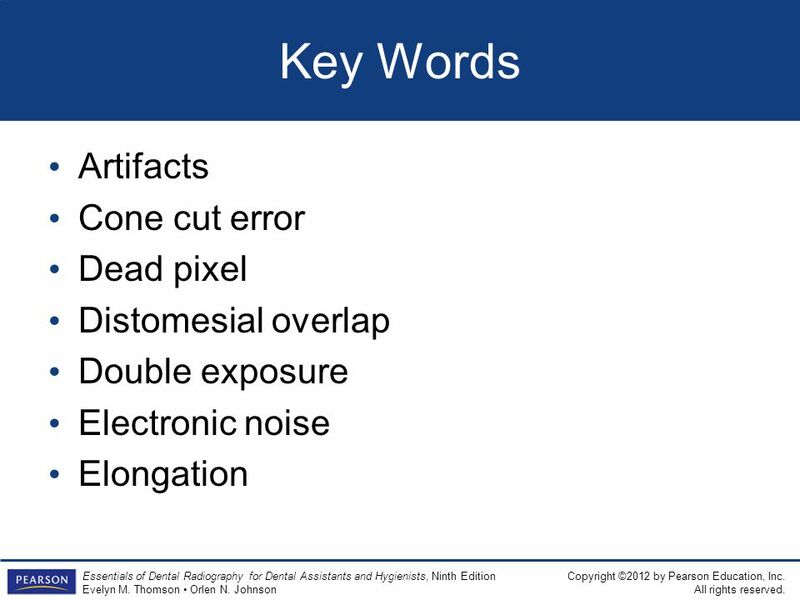 Download ppt "18 Identifying and Correcting Undiagnostic Radiographs." TECHNIQUE/PROCESSING ERRORS TERMINOLOGY DA 118. 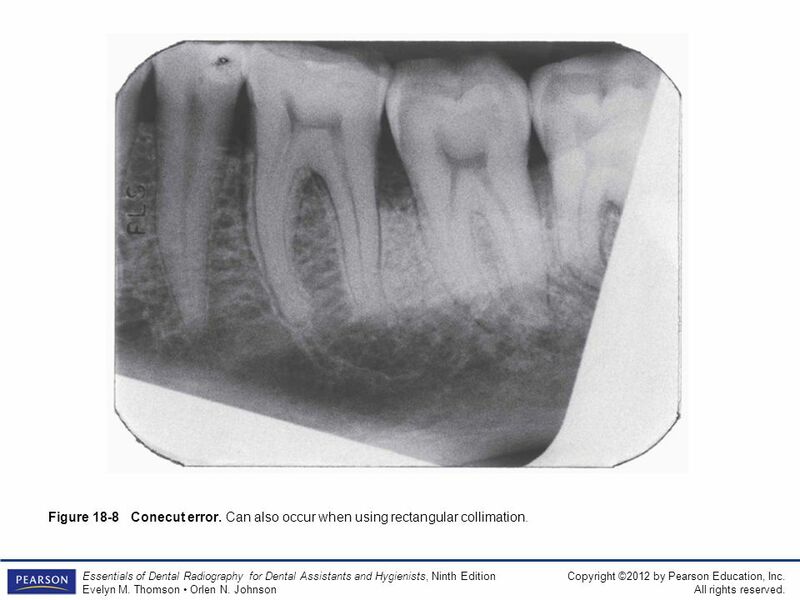 RADIOLUCENT Terms used to describe the black areas and white areas viewed on a dental radiograph are radiolucent. 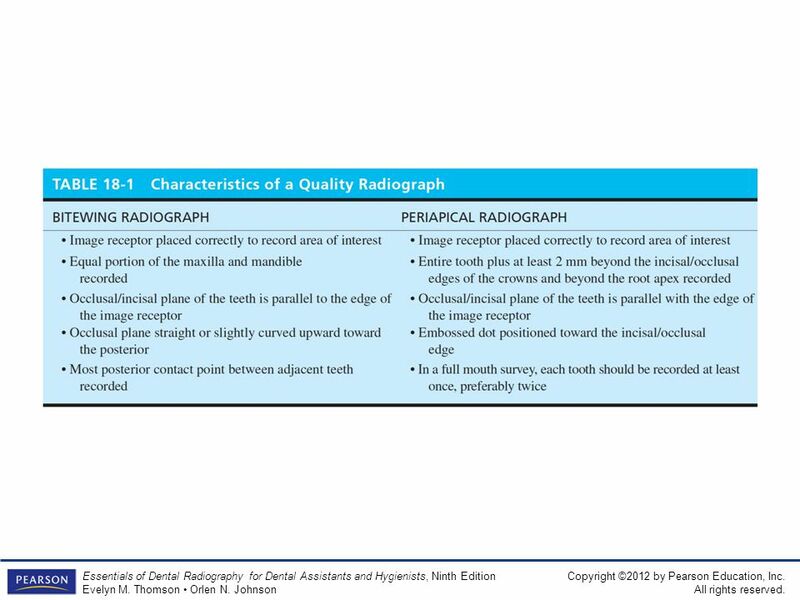 Essentials of Dental Radiography for Dental Assistants and Hygienists CHAPTER Copyright ©2012 by Pearson Education, Inc. All rights reserved. Essentials. 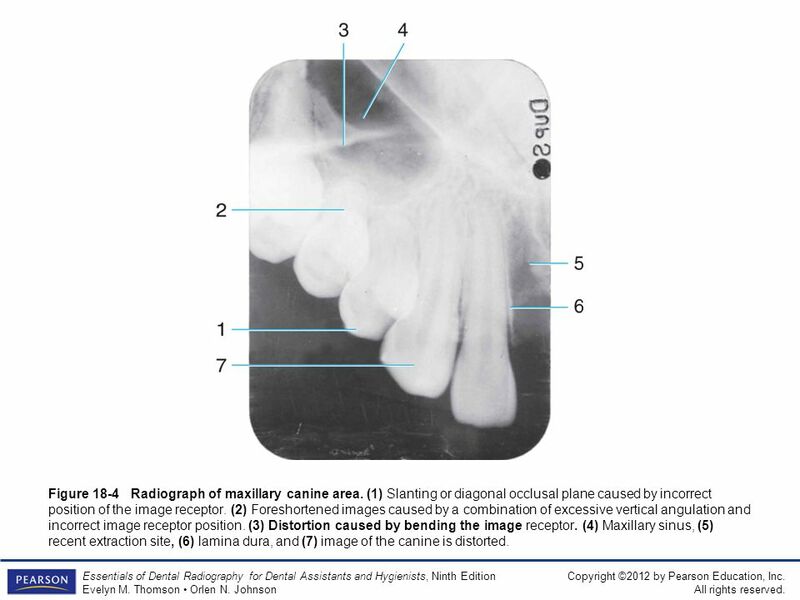 24 The Use of Radiographs in the Detection of Dental Caries. Copyright © 2006 Thomson Delmar Learning. ALL RIGHTS RESERVED. 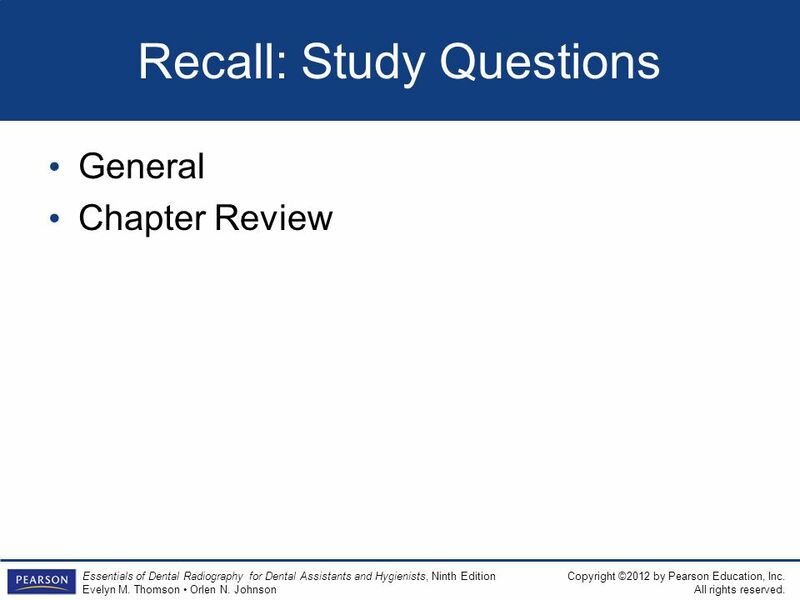 1 PowerPoint ® Presentation for Dental Radiology with Labs Module: Dental Radiology. 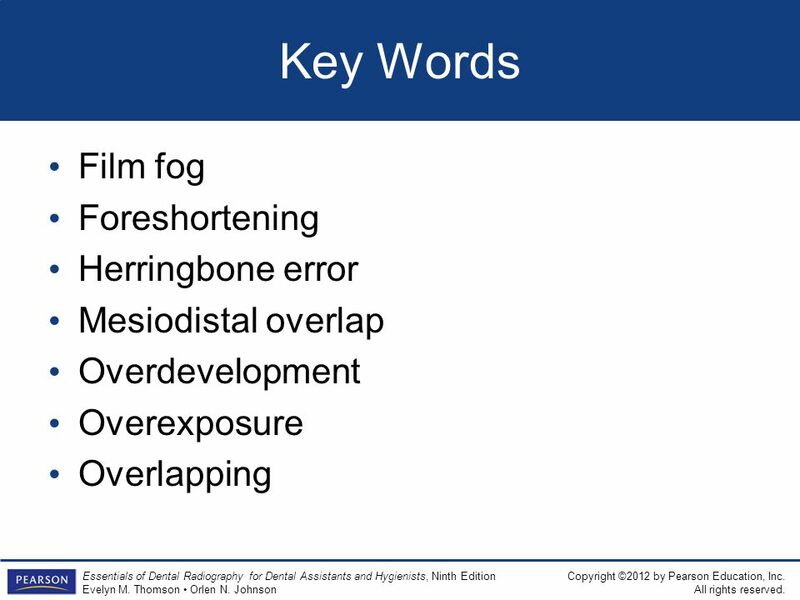 1 Paralleling Radiographic Exposures: The Preferred Method XCP. OCCLUSAL EXPOSURE TECHNIQUES. 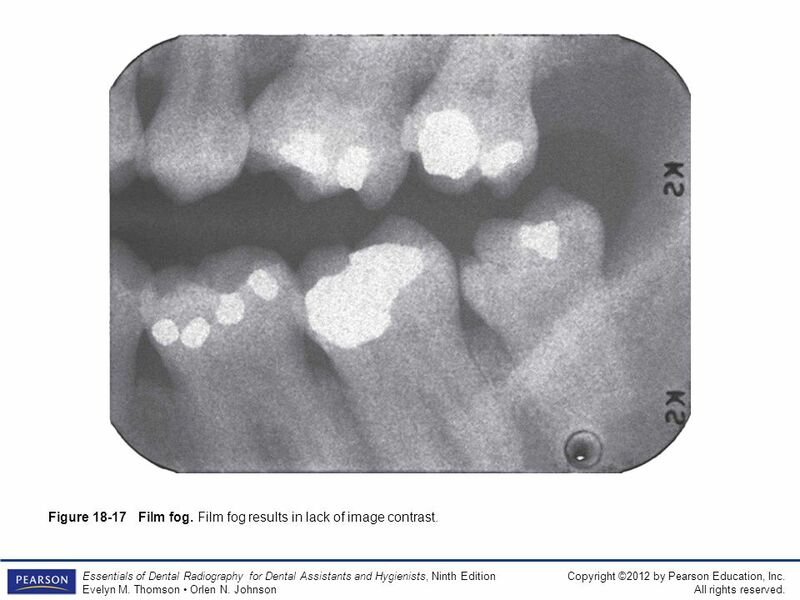 At times, more extensive radiographic views of oral tissues are desired than are obtainable with periapical or bite-wing. Copyright ©2012 by Pearson Education, Inc. All rights reserved. 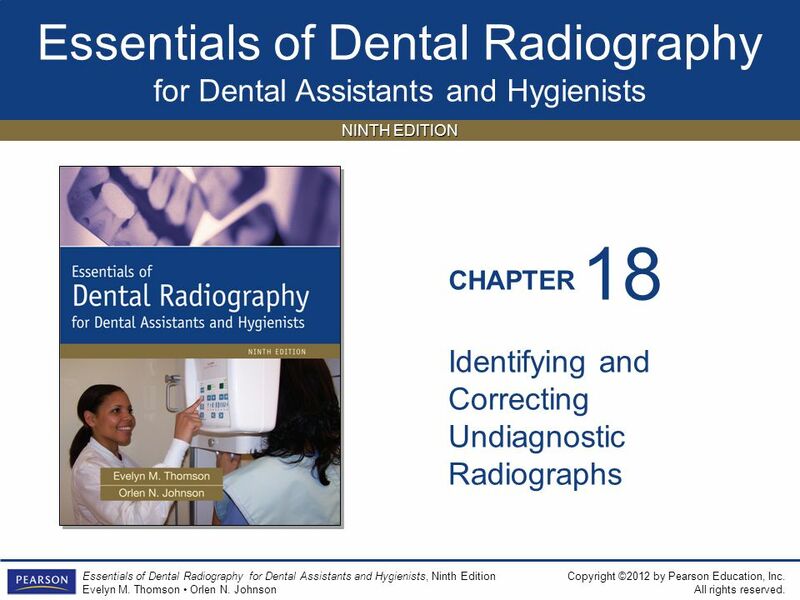 Essentials of Dental Radiography for Dental Assistants and Hygienists, Ninth Edition Evelyn.